family, Krasky realized his dream of living in the United States in 1999 after a very long and arduous journey. Krasky finally found work as a security guard until he was laid off in 2008 due to not being a US citizen. 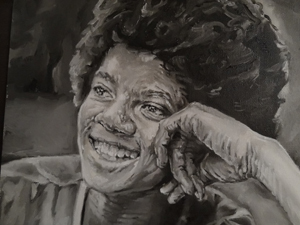 Doing pencil drawings since the age of four, it was in April of 2009 that his wife first encouraged him to pursue a class in oil painting, where it quickly became apparent that he had an amazing talent for the craft. In that short time, Krasky has established himself as one of the most well known and talented artists of our time, recently receiving recognition from President Obama. His works are heavily sought after and are routinely on display at the famous Bellagio Hotel in Las Vegas. 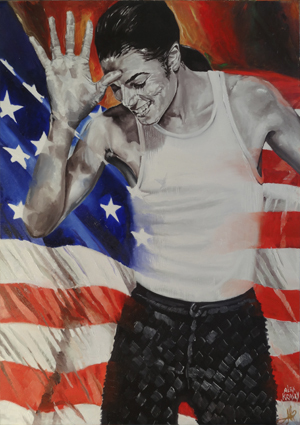 Aside from portraits of his favorite icon, he wants his art to inspire social change in America. “America Wake Up” presents several powerful and hard hitting messages dealing with social issues stemming from the recent housing and economic crisis. He is currently working on a spectacular oil portrait he is calling “Save the Future of America”. 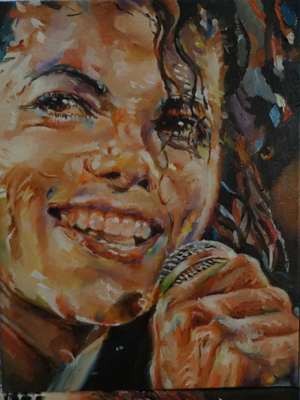 View some of his incredible Michael Jackson artwork and contact him to inquire about custom artwork starting at only $280 for 9”x12” paintings (oil on canvas) and $150 for detailed pencil sketch work.